Mix and match set of Rustic Personalized Glasses with Carved Tree, Heart, Initials and Date. Set includes one pilsner and one wine glass. So you're planning your rustic woodland wedding and you're either the "not so traditional" couple or you're just really not that into champagne. 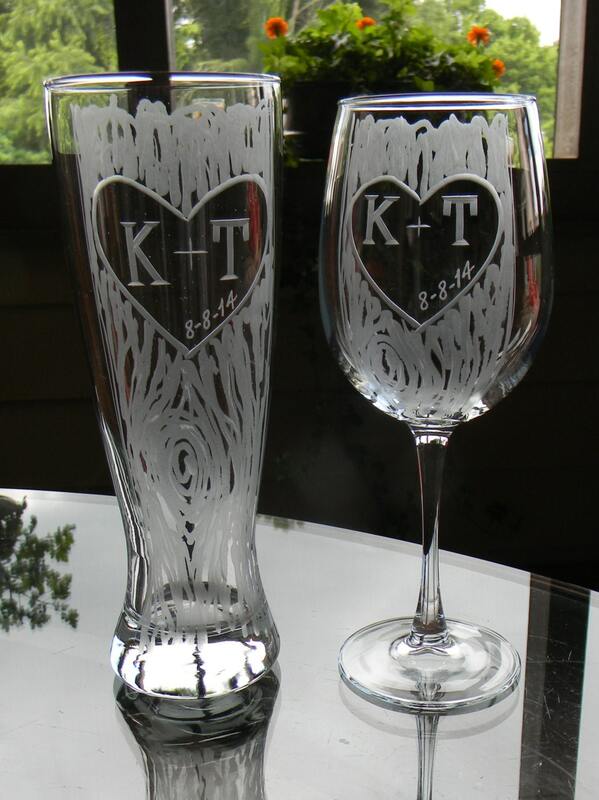 Toast to your new life together with this hand carved beer and wine glass set. Your initials are cut into the heart and tree design that has all been hand engraved just for you. Each piece these start out a blank glass and I hand cut this rustic heart and tree design into the glass with my stone wheel using three different stones to create a realistic tree bark affect. I finish with your personal initials and wedding date to make them a memorable keepsake of your special day! These are also a great Anniversary gift for the not so traditional couple. *This listing is for 2 pcs including one pilsner and one wine glass. Absolutely in love with theses glasses. Can't wait to use them at our wedding!! Thank you so much! Exactly what I wanted and completed and shipped so quickly! Got these as a gift for a bridal shower. They are wonderful and fast shipping. I have not given them to her yet but I am sure she will love them.